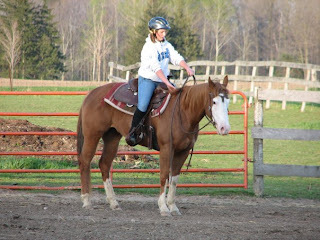 Linda is a student of mine who has dedicated much of her time over the past couple years to a special horse named Sadie. 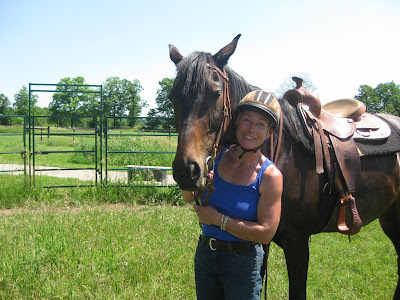 Sadie was originally purchased by Linda to be simply a companion animal for her trail horse Ellewood. Linda bought Sadie in rough shape. She had been raced briefly, and obviously suffered some tendon injuries that resulted in pin-firing all up and down all four legs. Pin-firing is a process believed to create scar tissue and therefore strengthen the tendons in the legs that are regularly strained by the intensity of racing. It involves a heated point being inserted repeatedly in the swollen area and leaves small white dot-looking scars. The effectiveness of the whole process is doubted my most vets and some people even consider it torture. Sadie has been bought from the track as a broodmare, but due to her already failing health from the stress of the track the baby took it's toll on her body. Linda then purchased Sadie from the previous owner when she was underweight and fed up with people. After several years of TLC at Linda's beautiful farm, Sadie started to come around. Still the boss mare, she came to enjoy Linda's touch and the sound of her voice. Last year, after seeing a huge improvement in the mare's health, Linda decided to see if we could give her a job. This meant putting her in training with me for several months through the summer. 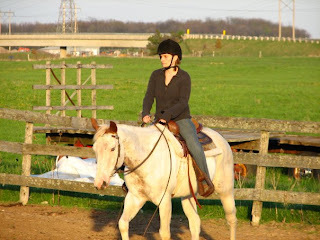 It was a test to see whether she would revert to her old ways, or whether she could enjoy being a riding horse. Linda worked hard keeping up with all that Sadie was learning, and learning herself some new training techniques to add to her toolbox. Sadie excelled with her training, and seemed to enjoy having something to do. This year, Linda started working with the horse (as much as the rain would allow!) herself, with the occasional "check-up" session with me. 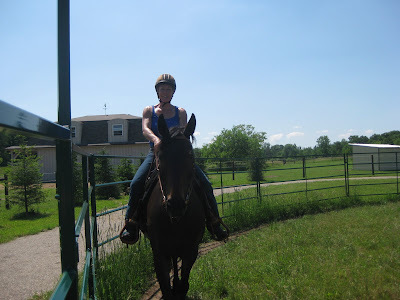 Check out this video of Linda and her first ride on Sadie that she was so kind to share with us on our Facebook group (until I can get it up on here...). Don't have us on Facebook yet? 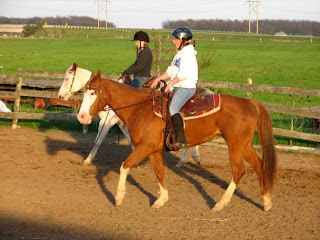 "Lindsay Hayes Equestrian Coaching and Training" is the group name. 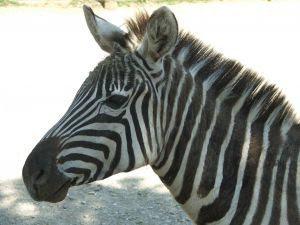 What do you get when you cross a horse and a zebra??? Stacey and Misty working hard in lessons. Misty is a registered paint. Almost all of her hair is white, with some small brown patches and she has BLUE eyes! Stacey is very beautiful as well. And here's Laura and Amy. 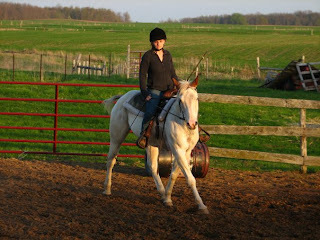 Amy is a 4 yr old Paint mare. Amy was in training with me for 2 months in January and February of this year and is owned by Lee Anne Hannaford-Monden. Lee Anne also owns the mare we have been visiting with the colt born this year. Amy has some white on her belly, and the white markings on her face are called a "bald face". Amy has brown eyes. 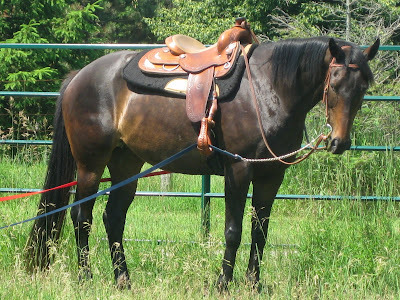 Georgia is another training horse of mine, owned by Teresa Corrigan. She is 6 years old and was just broke to ride last year. 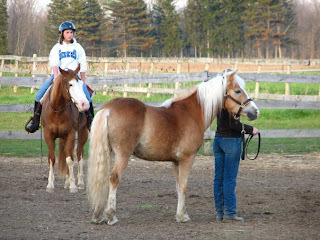 Georgia is a Halflinger pony (resembles a small Belgian horse). This is Georgia's first lesson with the other horses, ask me how she's coming along!! Ok, Ok, so maybe this isn't around the lesson barn but it is around one of the 2 other training barns I visit almost daily. More pictures soon to come!